A new algorithm is helping the rover do just that. 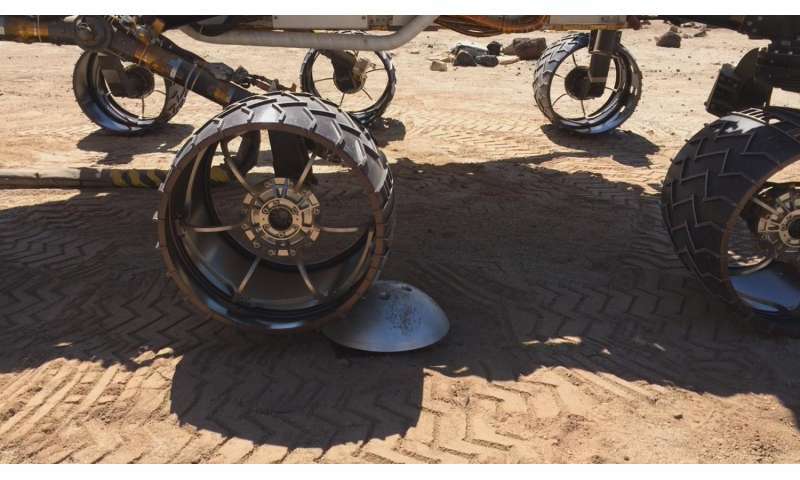 The software, referred to as traction control, adjusts the speed of Curiosity's wheels depending on the rocks it's climbing. After 18 months of testing at NASA's Jet Propulsion Laboratory in Pasadena, California, the software was uploaded to the rover on Mars in March. Mars Science Laboratory's mission management approved it for use on June 8, after extensive testing at JPL and multiple tests on Mars. Even before 2013, when the wheels began to show signs of wear, JPL engineers had been studying how to reduce the effects of the rugged Martian surface. On level ground, all of the rover's wheels turn at the same speed. But when a wheel goes over uneven terrain, the incline causes the wheels behind or in front of it to start slipping. In either case, the climbing wheel can end up experiencing higher forces, leading to cracks and punctures. The treads on each of Curiosity's six wheels, called grousers, are designed for climbing rocks. But the spaces between them are more at risk. "If it's a pointed rock, it's more likely to penetrate the skin between the wheel grousers," said Art Rankin of JPL, the test team lead for the traction control software. "The wheel wear has been cause for concern, and although we estimate they have years of life still in them, we do want to reduce that wear whenever possible to extend the life of the wheels." The traction control algorithm uses real-time data to adjust each wheel's speed, reducing pressure from the rocks. The software measures changes to the suspension system to figure out the contact points of each wheel. Then, it calculates the correct speed to avoid slippage, improving the rover's traction. Traction control also addresses the problem of wheelies. Occasionally, a climbing wheel will keep rising, lifting off the actual surface of a rock until it's free-spinning. That increases the forces on the wheels that are still in contact with terrain. When the algorithm detects a wheelie, it adjusts the speeds of the other wheels until the rising wheel is back into contact with the ground. Let's not forget it was designed as a 2 year mission.... we're now on 5.